Hello there! How’ve you been? I’ve been quiet on the blog for the past seven months and for the most part, all has been well for Jody us over that period of time. We had one threat of a hospitalization in April but thankfully it was avoided. Probably the most exciting thing that happened to us during this time was selling our home of 11 years, moving into an apartment for two months and finally, buying our new home in April. Our “new” home was built in the early 70’s so we have big dreams about all the changes and upgrades we’d eventually like to make (it’s good this will likely be our “forever” home because it might just take us that long to carry out our plans). Jody’s to-do list seems a mile long and sometimes he feels overwhelmed by it. When I hear him talk about how much he has to do I’m reminded of a time, not so long ago, when he yearned to be able to put his hands-on, fixer-upper, woodworking skills to good use. Instead, during that time he and his new friend Tank (aka his oxygen tank) spent a lot of time getting to know each other, home projects not included. Despite his never-ending project list I know Jody is excited about getting his hands dirty again and what a great job of it he has done! Perhaps I’ll write another post about some of the improvements he’s made to our new home and include some before and after pictures. I mean really, who doesn’t love a good before and after photo? Jody clearly keeps himself pretty active, thanks be to his recycled lungs. Unfortunately, however, this activity has caused him some recent problems. A couple of weeks ago he started experiencing sharp, jagging pain in his chest area. His transplant team sent him for a chest x-ray which confirmed that his sternal wires (the wires placed during transplant to hold his cracked sternum together) were broken in SIX places!!! We were told this could likely be fixed through laparoscopic surgery with an overnight stay for observation only. Yesterday we met with Dr. Bush, the cardiothoracic surgeon at Hopkins to discuss the surgery needed to remove the wires. On a side note, Jody’s transplant surgeon, Dr. Shah, moved to Tennessee last year and Dr. Bush is his replacement (from San Francisco). It was great to finally meet him and we were impressed by how personable he was. Since November Dr. Bush has performed 12 lung transplants at Hopkins (and who knows how many heart transplants?). Now back to Jody… In our meeting with the surgeon yesterday we learned that removing Jody’s internal wires would be a little more complicated than originally thought. 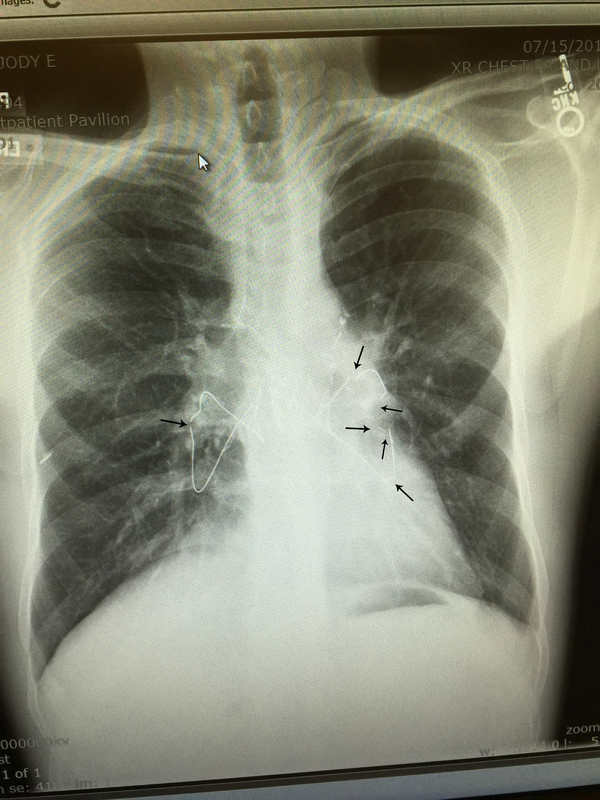 It is apparently not uncommon for one to have a (as in one) break in chest wires a few years out of transplant when activity level picks up. What typically happens is that once that wire breaks open it releases the pressure on the wire (which was wrapped tight around the bones to hold them together until fused). After this release in pressure, the wire doesn’t normally break again and can be pulled out in one piece, done as simple outpatient surgery. Dr. Bush seemed at a loss for why Jody’s wires continued to break in so many places since they were no longer under pressure. By that point though it didn’t really matter so much why they broke but rather how to remove them. Dr. Bush planned to make two incisions along Jody’s original transplant scar line. Using guided fluoroscopy (a live x-ray that shows movement) he would locate the migrating pieces and remove them, along with the intact wire. 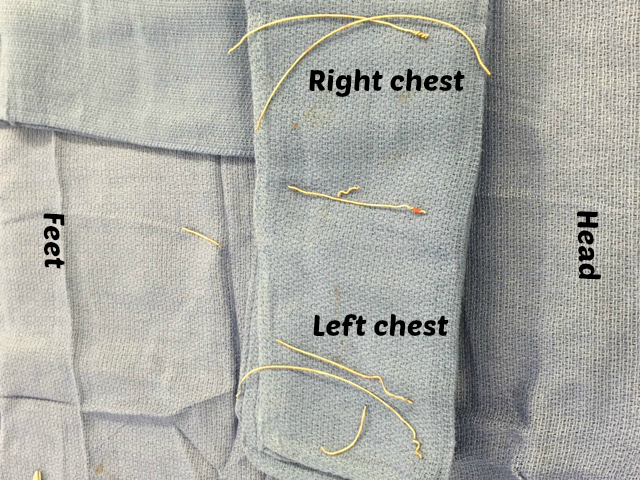 The location of the small pieces and the degree of scarring between the lungs and chest wall would determine the level of difficulty in removing the pieces. It is expected after lung transplant to have some degree of scarring. Too much scarring would disqualify Jody from ever being able to undergo a second double-lung transplant should he need one. Dr. Bush said this surgery may or may not give us an indication on how much scarring is present. He also noted the likelihood of Jody needing chest tubes after surgery to allow for drainage of air and blood. These were quite painful for him following transplant so we hoped they can be avoided. If chest tubes would be used it would require Jody to spend a few days in the hospital. This wasn’t exactly what we wanted to hear but we’ve learned to roll with the punches. Shortly after we got home from our pre-op appointments at Hopkins yesterday, Jody received a call from a doctor stating that his potassium (K+) level drawn earlier in the day was high (6.4) and he needed to go to the ER for IV fluids. The normal range for K+ is 3.5-5.5 and while it might not seem like he was much over the normal range, this is an electrolyte that impacts the rhythm of the heart and therefore needed to be treated. Any dialysis nurse will tell you they have lost patients due to high serum (blood) potassium levels. Jody’s kidney function is decreased but not enough to cause such a spike in his K+. After some discussion it was decided that he would come to Hopkins to be directly admitted instead of going to a local ER. Once at Hopkins they redrew his labs and started an IV while waiting for the labwork to come back. They planned to give him laxatives throughout the night that would help him excrete the potassium through his bowels (so much for a good night’s sleep). If the K+ level would not come down, surgery this morning was going to be cancelled. This was the point when I put a call out via our Jody Needs Lungs Facebook page, asking you to pray. Jody took his first dose of the laxative and 30 seconds later the doctor came in and said his repeat K+ level as 4.9. Normal! What lousy timing, had he come in 30 seconds sooner Jody wouldn’t have needed to take the laxative. Still, we were glad that our prayers had been answered and his level was back to normal. It does make us question the accuracy of the original result. Jody still received IV fluids overnight to help improve his kidney function but at least he no longer needed to be hooked up to the heart monitor nor receive multiple laxatives throughout the night. The wire that moved and made surgery easier. Also if you enlarge the photo you can see the area where the sternum was cut in half during surgery. This morning went off without a hitch. His potassium level stayed down throughout the night. A repeat chest x-ray today showed more broken wires but one of the broken pieces migrated to a better, more superficial, area. The surgeon seemed pretty excited about this, noting that it would make the piece much easier to remove. This would require another lower incision but seriously, after a lifetime of scar-inflicting procedures/surgeries, what was one more? 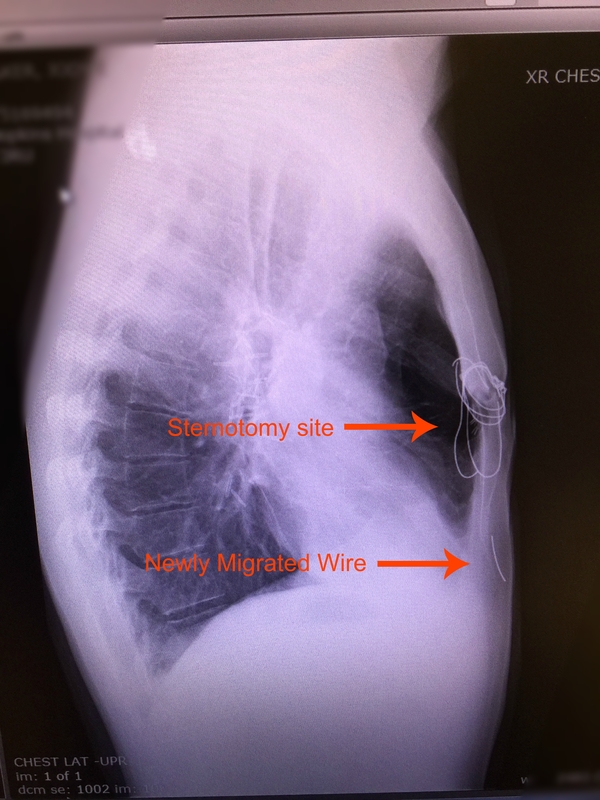 Again the surgeon questioned why his wires migrated so freely but soon they would be gone altogether. Shortly thereafter Jody left for the OR. As I was working on this post while Jody was in surgery Dr. Bush came out much sooner than expected to tell me surgery was done. His exact words were, “This was the easiest wire removal I’ve ever done, it was bizarre!” I don’t think it was bizarre, I think it was God! The wires were all superficial so he didn’t even see the lungs. He also mentioned that Jody must not have much scarring because of the way the wires were able to migrate freely (again, totally God!). No chest tubes. No exploring. No complications. Easy peasy. Dr. Bush even told me he could go home TODAY!!! Once again I felt humbled by God’s grace and the miracles He has performed in Jody’s life. As it turns out we won’t be heading home today. The anesthesia used for Jody’s surgery hit him hard and he spent all afternoon fighting nausea, vomiting and light-headedness. He is still very sleepy but is finally starting to feel a little better. Pain has been minimal. I’m confident we’ll be home tomorrow and am glad to be on the other end of this. I’m especially relieved that surgery went so much better than anticipated. We appreciate your prayer support and believe it impacted the outcome of the events of the last two days. Here’s to Jody living pain and wire free! Just for fun: On the right is a picture Dr. Bush took for me. He laid the wires out as they were positioned in Jody’s chest (Picture Jody lying on the OR table with his head to the right in this picture and feet to the left). Eight broken pieces! No wonder the poor guy was in so much pain with all those wires floating around.